About a month ago, I was invited to speak at the first annual dinner of the Pennsylvania chapter of the Council on American-Islamic Relations (CAIR), evidently because I had taken part in a pray-in to protest against the exclusion of a group of imams from flying - and maybe because I also knew and was known by Iftekhar Hussain, head of the Pennsylvania chapter. At that point the only CAIR folks I knew were Iftekhar and Ahmed Bedir, who leads a Florida chapter of CAIR. I knew him through the Tent of Abraham, Hagar, and Sarah, the group of Jews, Christians and Muslims, which has been meeting for almost four years and has initiated a series of multireligious projects. They include the "Sacred Season of Shared Sacred Seasons," which this fall continues when Ramadan, the High Holy Days, Worldwide Communion Sunday, and the Feast of St. Frances are intertwined) and a book of which I'm co-author with Sister Joan Chittister and Murshid Saadi Shakur Chisti, The Tent of Abraham: Stories of Hope and Peace for Jews, Christians and Muslims. I respect both Iftekhar and Ahmed deeply, and know them for compassionate, intelligent, and peaceful people, bringing a wise and compassionate understanding of Islam to work for justice and peace in America. So I readily agreed. Since I knew little about National CAIR, I did some reading - especially of a major article in the New York Times on ways they were being harassed, often by right-wing organizations in the Jewish community who claimed they were associated with terrorists. But the article made clear that CAIR works with the Federal government, is respected by Federal law-enforcement agencies, and speaks out strongly for civil liberties and human rights. Not a terrorist profile. My reading of the Times article and my browsing on the CAIR Website strongly indicated that attacks on CAIR have little or no substance and are based on the kind of innuendo and strings of X to Y to Z to A that made infamous the names of Joe McCarthy and Roy Cohn. Just as I was being invited to speak, so was Congressman (and former Admiral) Joe Sestak, newly elected to Congress from a suburban Philadelphia district on a strong antiwar platform. He accepted. And then some Jews in his congressional district complained. They urged him to renege. So I not only said yes to my own speaking, I wrote encouraging Congressman Sestak to continue with the courage and good sense he had already shown in treating Philadelphia CAIR and its members as full members and participants in the democratic process, to be honored by him as well as to honor him. So now let me report on the dinner itself, this past Saturday evening -- and on its aftermath - especially a half-bottomed story in the Philadelphia Inquirer and my letter to the editor about it. 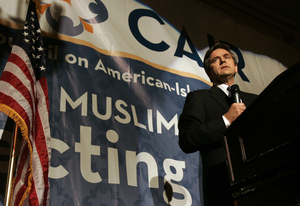 Sestak did speak, both affirming the Muslim presence and activism in America and urging some changes in CAIR's positions. He received a standing ovation. In addition, there was a protest band of three or four picketers, all Jewish, outside the hall, angry that Sestak was speaking. A larger number of Jews attended as supporters, including another rabbi besides me; there was a supportive letter from one additional rabbi in the printed program, and a positive ad from a smallish activist Jewish organization, Jewish Voice for Peace (no relation with the Philadelphia Jewish Voice). I spoke as a religious Jew committed to peace between Israel and Palestine and to peace between the United States and the Muslim world -- speaking to religious Muslims who strongly applauded my call for renewed dedication to a peaceful two-state Israel-Palestinian peace settlement. They strongly applauded my remarks about the need for each single one of us members of the family of Abraham to feel personally wounded when any member of the family kills another. Former Ambassador Ed Peck gave the keynote address. Some of his family were Jewish, and were murdered in the Holocaust. Governor Ed Rendell of Pennsylvania gave a warm and warmly received speech. He is himself Jewish and has excellent relations with both the Jewish and Muslim communities in Philadelphia. Yet the article that appeared next day in the Philadelphia Inquirer in the lead space in the Metropolitan section spun the event into a seeming collision between the Jewish community and CAIR. None of the supportive Jewish presences -- people, speeches, program book -- were reported in the article. Rendell's presence was barely mentioned. Peck was not mentioned at all. And while the article reported the uncorroborated assertions by two local Jews that CAIR "has connections to terrorists," it did not report that in fact CAIR speaks out strongly against terrorist attacks by Muslims. Feeling that this kind of reporting gives credence to McCarthyesqe lies, I both wrote the reporter Tom Infield who wrote the story and a submitted a Letter to the Editor. The latter (condensed a good bit by the Inquirer's editors, and with one very important missing piece) was published, along with a parallel letter from a Muslim who had attended the dinner and who praised Jewish "moderates [who] represent the true voice of the Jewish community." The piece missing from my letter had pointed out how reporting a slander without the facts refuting it is a way of giving credence to the kind of falsehood that besmirched the names of McCarthy and Cohn. And this is perhaps the most important fact about the whole affair. For this event does not, unfortunately, stand alone. Recently, in California, Senator Barbara Boxer "rescinded" an award for active democratic citizenship she had given to a CAIR worker, after pressure from some limited parts pf the Jewish community. When there was a rousing protest against her rescinding the award, she retreated into silence. Of course I am not saying that CAIR is perfect, that I always agree with it, or that there is no point in Muslims and Jews not only listening to each other and encouraging each other but also arguing, debating, dialoguing, wrestling with each other - in both directions, neither just Jews nor just Muslims insisting on their own perceptions as the only reasonable ones. At the dinner itself, there were certain phrases used by one of the CAIR speakers that troubled me. For example, a reference to "pro-Israel extremists" made me uneasy, though I am aware that many people refer to "Muslim extremists." As a result, in my own talk I went out of my way to describe myself as "extremely committed to a just, decent Israel --- and thus I am a pro-Israel extremist --- and a pro-Palestinian extremist in the same sense --- and a pro-peace extremist." Aside from phrases, there is one outlook of CAIR's that has led to criticism. CAIR strongly condemns terrorist actions, but not whole organizations. To many American Jews, its unwillingness to make a blanket condemnation of Hamas or Hezbollah seems contradictory, if it really opposes terrorism --- because most US Jews, and the US Government, define Hezbollah and Hamas as simply terrorist groups. But CAIR points to the complex reality in which both groups are simultaneously woven of strands that include social-service organizations with schools and medical clinics, etc. ; political parties; friendship groups and ethno-religious communities; police forces; and military / terrorist agents. Much of the non-military parts of this complex, in both organizations, meets real needs on the ground, and much of it is woven into Palestinian or Lebanese society. Indeed, there is considerable evidence that inside Hamas, at least, there are different sub-groups with competing views and policies about terror and violence. Careful ethical challenges to the use of terror could actually help strengthen the peaceful forces. So CAIR's view is that to condemn the whole organization outright, as distinct from specific terrorist actions, is to demonize all its parts instead of trying to peel away the disgusting actions that CAIR does oppose. To me this view roused some interesting echoes of my own criticisms of parts of the so-called Left that attack Israel --- the whole society or its whole government --- instead of condemning specific aggressive and oppressive policies and actions of the Israeli government. Perhaps there is some way to condemn specific actions while naming, but not condemning, the organizations that are partly involved --- as I do when I condemn particular actions of the Israeli government, naming it while not attacking the government as a whole. So I am hopeful that the dinner last week is a spark of light. Far from showing irreparable conflict between the Jewish community and CAIR, in fact the dinner showed that a seriously peace-committed part of the Jewish community can work with a seriously peace-committed part of the Muslim community, despite the existence of some violence-supportive people in both communities. That is the truthful and important story.